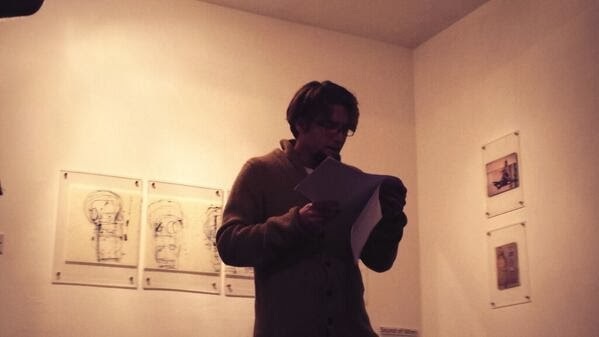 My reading at Hardy Tree in London on Saturday 23rd Nov 2013.
thank you Saint Erkembode! thank you SJ Fowler! Thank you Hardy Tree! Thank you fellow poets and friends and saintly travellers . . The poems are from my book in progress Play Yr Kardz Right. Held at the Hardy Tree gallery in Kings X, London on November 23rd 2013, for the Erkembode: not just another saint exhibition, a series of poetry readings from contemporary British vanguard poets who have collaborated or worked closely with the artist David Kelly http://www.erkembode.com including poetry from Marcus Slease, Holly Pester, SJ Fowler, David Berridge, Robert Kiely, Tim Atkins & Sarah Kelly.